Firstly; By-the-wind Sailor, what a wonderfully romantic name! 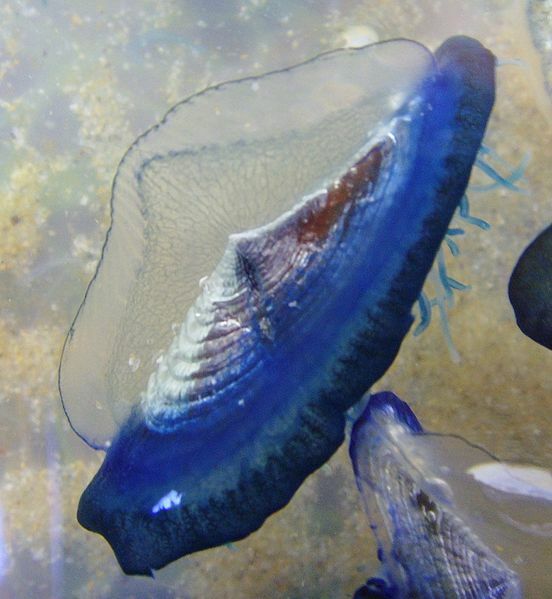 They get it from their lifestyle which is similar to our very own Portuguese Man o' War, although they are much smaller and clearly a lot less famous. Sailors reach about 7 centimetres across and have quite a tough, rigid sail to harness the wind. It's actually made of chitin, like insect exoskeletons. The sail I mean, not the wind. Like the Man o' War, individuals have sails that bear either left or right into the wind so that when thousands are washed up on a beach, another few thousand have been sent in the opposite direction. When you have one sail and no oars or boat propeller I suppose something like that is necessary. A 50-50 chance is better than none at all! Surrounding the sail are rings of air filled tubes to provide buoyancy. Despite the lovely name and care-free (until you hit the rocks) life style, By-the-wind Sailors are Cnidarians, which means they are meat eating, stinging monsters. 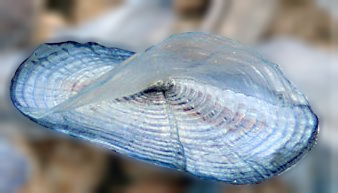 In this case the tentacles are short, only about 1 cm long, and hang down below the edge of the disc and into the sea. They feed on tiny plankton of various kinds and seem to be completely harmless to humans, clearly a terrible disaster for their chances of fame. It looks like most people consider By-the-wind Sailors to be made up of hydroid colonies, again, much like the Portuguese Man o' War. Instead of one, big animal, it's actually made up of lots of little ones that work together. It looks like others disagree and prefer to see it as something more like a floating, upside down Sea Anemone with a sail on its foot. They both sound great to me! Either way, By-the-wind Sailors are all either male or female. When they mate, they first produce thousands of tiny jellyfish. These are about 3 mm across and are slightly brown because of their friends; inside their bodies are tiny microalgae that can gain energy from the Sun and provide some to their host. They are effectively paying for bed and board, which is nice of them. Eventually, the jellyfish will release sperm or eggs into the water to create new By-the-wind Sailors. Its a pretty odd life cycle, but then Cnidarians are utterly immersed in oddity so we'll just have to get used to it. I find it strange that I hadn't heard of these creatures before. Loads of them get washed up all along the West coast of the US every year and they've even done the same in good ol' Blighty. They look lovely with their rich, blue colours and concentric circles, yet there doesn't seem to be a great deal written about them. Shame. Looks like the Portuguese Man o' War has stolen all the limelight! Yeh! I suppose it's understandable, but it's still a bit odd. Some animals even get famous because people think they're dangerous when they're actually completely harmless. Weird. You are a wonder. You come up with the best unusual creatures. Thank you! I have to say, it's great fun discovering and learning about these strange animals. And sharing them, of course! Harmless to humans? So I could pick one up and put it in my palm and those little 1cm tentacles couldn't hurt me? Hypothetically, of course. Not that I'd go to the west coast to play with brightly colored sailboat jellyfish. Never. Yes! Apparently you might feel a slight tingle at most but you might not feel anything at all. Still, there's always the whole thing of touching your eyes or something afterwards, which might not be so good. You're right though, and it's a bit strange when you think about it, but it's best to leave little jelly things alone in case they cause you horrible pain. Oh, and when I say you won't feel anything, I also mean it won't harm you. The worst thing would be if it was slowly killing you and you didn't even know. Such is our complicated love/hate relationship with pain.